Our comfortable, air conditioned practice is comprehensively stocked with a large range of prescription and over the counter medicines for all your needs. We also stock an extensive range of health and beauty products together with a selection of medical and beauty electrical products. Our large consultation room is available if you wish to discuss something in private and is home to an ever increasing range of exciting services. Mychem Ltd is an independently owned company which has healthcare interests in various areas including retail pharmacy, pharmaceutical wholesale, property and general medical services. The company has a strong healthcare footing with advisors from the medical, dental, optical and care home specialities providing constant feedback as to how Mychem Ltd can provide the best possible care through our Pharmacy to meet the changing healthcare needs of all our patients. Tollesbury Pharmacy opened in November 2008 and has gone from strength to strength. Dimple Bhatia - is the Superintendent Pharmacist and has worked in the Maldon area for over 10 years. Dimple qualified with BSc(HONS) in Pharmacy in 1996 from Aston University in Birmingham. During his undergraduate days Dimple showed an interest in cost effective prescribing and pharmacy practice. His undergraduate project involved the rates of generic prescribing at a district general hospital. 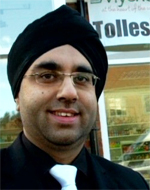 On graduating Dimple carried out his Pre-Reg year at BootsThe Chemists in Ilford, Essex, where under the supervision of an excellent management team firmly established Sunday Trading and he became Sunday Manager. Upon qualifying as a pharmacist Dimple moved to Boots The Chemist, Central London and Worked as a relief pharmacist in District 81, covering Holborn, Tottenham Court Road and Oxford Street Stores. Dimple was then appointed Store pharmacist at Boots, Picaddilly Circus and then promoted to Operations Manager. Dimple missed his clinical interaction with patients so decided to leave Boots in 1999 and begain as a self employed locum, working for all the major chains and some smaller independents. It is then that Dimple realised that there was a better way of providing pharmaceutical services and realise what patients wanted and needed from their community pharmacist. In 2001 Dimple successfully passed The Diploma in Therapeutics at The College Of Medicine Wales. After settling in Maldon and working at a busy independent for a number of years Dimple decided to open his own pharmacy. Dimple and his team believe in a WORLD class service which EXCEEDS the patients experience at EVERY level of interaction. We all choose where to buy our bread from and which airline to fly with, although price is a factor, the service, customer experience and back up, we believe are even more important. That’s why Tollesbury Pharmacy now not only deals with patients locally but has a list of regular patients from around the UK. Tollesbury Pharmacy has over 100 years of Community Pharmacy experience amongst it’s staff; being 100% independent and privately owned means the people you speak to are the ones making the decisions, we are not tied to any supplier or any group. Tollesbury Pharmacy has the means of dealing with any company to satisfy the needs of its patients. Hayley - Is a Registered Pharmacy Technician and Smoking Advisor for the local NHS stop smoking scheme. Hayley has ten years experience in Community Pharmacy and manages the day to day running of the dispensary. Eileen - Is a Senior Dispenser who has over 40 years experience in retail pharmacy. Eileen manages the dispensary stock and ensures the right prescription products are always in stock in the right quantity at the right time. Eileen also looks after our nursing homes business and ensures the day to day running of our nursing homes. Like all our team she has strong links with care home staff and local surgeries to ensure the provision of medicines to care homes is handled in a professional, timely and personal manner. Kathy - Is a Senior Dispenser who has over 40 years experience in retail pharmacy. Kathy has strong management experience having managed a multiple branch for a number of years earlier in her career. Kathy manages the dispensary and looks after the MDS in the community. Kathy has a keen interest in training and enjoys keeping abreast of new pharmacy products. Shirley - Manages the counter and is responsible for stock control. Shirley is knowledgeable on all health and beauty products and will always ensure that you find the right product. Shirley has over 20 years experience in Community Pharmacy. Shirley is the key buyer for health, electrical, beauty and perfume, she has key links with many suppliers ensuring that the product offering is varied, competitive and good value. Anita - Is our driver and with a smile on her face come rain, hail, sun or snow will always make sure your medicines are delivered to your doorstep on time.